Gold prices were on a bumpy ride during yesterday's session printing a high of $1235.8 but settling at $1230 despite the Dollar getting weaker. The greenback will face more pressure as Democrats will take control of the House and it is widely believed that they would use the majority to pursue investigations into Trump's Russia ties leading to a political turmoil in Washington. Also they may move to raise at least five taxes related to individuals, corporations, and inheritances. It is a big threat to the recent Dollar bullish uptrend as the pressure on the yellow metal eases. 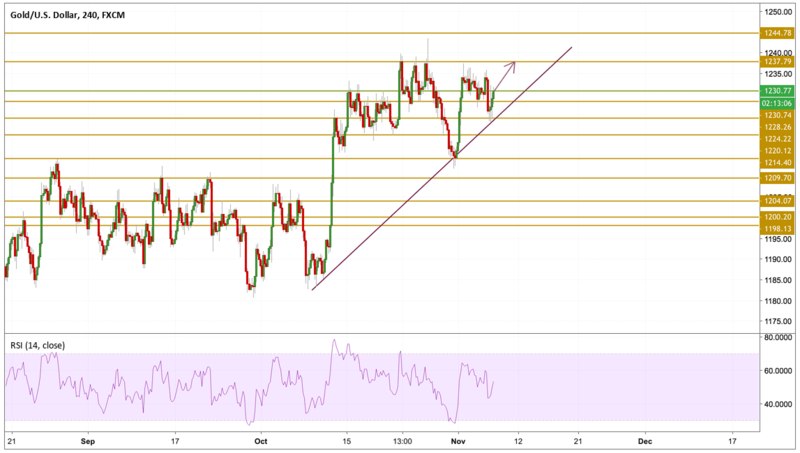 Gold prices entered into a consolidation phase after reaching the $1237 level last week and then retreated towards the $1231 level. The price is currently hovering around the 1230 level with a relatively strong momentum which may send the price back above the $1237 level before entering into an overbought state. The next level we will be focusing on is the $1237 level, keeping in mind that volatility could pick up anytime especially after yesterday's midterm.